When someone searches at Google, their query might not express the informational or situational need that they have. It might be too broad, too ambiguous, or vague in some other manner. A well-formulated query instead might contain terms returing resources addressing the searcher’s intent, which might be measured by performance metrics. For vague queries, search results that satisfy a searcher’s need for information might not be highly ranked, and may not be presented on a first page of search results. A search engine may identify well-performing queries from queries entered by users. This is especially true in cases where many searchers have selected results from those queries. These well-performing queries may be suggested to searchers when similar queries are presented to a search engine. To generate even more synthetic queries. Many queries performed by searchers are unique, and there might not be “similar” queries to many of them already performed by searchers. A search engine might look for a way to understand what it finds on the web better by performing a number of searches on its own, in a way that might tend to produce positive and relevant sets of results, much like the well-performing queries identified by searchers. These would start out as seed queries. Seed queries can be machine generated synthetic queries or they can be searcher queries provided by searchers anonymously. Queries provided by searchers might have their performance determined from anonymous user interactions. If the query performs well, it may be selected as a seed query. That is, if many searchers that enter the same query often select one or more of the search results relevant to the query, that query is can be designated as a seed query. In this case, documents referenced by the “often-selected” search results are also designated as documents corresponding to the seed query. This process might start by a search engine receiving the set of seed queries that could be associated with a structured pages on the sites mentioned above. The search engine might pay attention to the HTML structure and embedded coding of those document, and the words that appear within that structure on different pages of the site. From the multiple pages of the site, the search engine might create “query templates” that might correspond to embedded coding fragments, along with a rule associated with these fragments that could be used to create one or more candidate synthetic queries, from that web site. 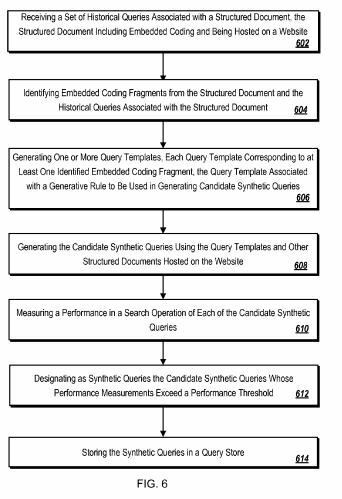 These candidate synthetic queries might be measured based on the quality of search results they return, and if those results exceed a certain performance threshold, the synthetic queries might advance beyond the “candidate” stage, and be stored in a query store. The embedding coding of structured documents might include HTML elements. Embedded coding fragments from pages may include identifying HTML tag pairs. Identifying embedded coding fragments from pages may include identifying some portion of content enclosed by an HTML tag pair; identifying a query term in seed queries; and when a portion of content matches the query term, within the embedded coding fragments. The query templates would look to see if there are other documents on a site that include the embedded coding fragment; and generating that template to satisfy a template qualification value. This query template may include a literal and a wildcard – the literal would be a literal phrase found in the structured page, and the wildcard including a type and at least one constraint. A “type” may indicate a category of terms. A “constraint” may indicate a context within which the terms appear in the structured page. This match might be an exact match, an approximate match, or both. How good a candidate synthetic query might be is a matter of calculating an IR (information retrieval score) for that query in relation to the page. Designating as synthetic queries the candidate synthetic queries that have performance measurements exceeding a performance threshold. These pages might be structurally similar to one another, and they might include pages relevant to stored seed queries within the documents. This includes an HTML tag pair <h1> and </h1> and text fragments from within the text pair – <h1> [ . . . ]–Biography</h1>. This structure is an “embedded coding fragment,” and it can be used by itself, or in conjunction with others on the same page to create a query template. Another embedded coding fragment on a different page of the same site might be “<h1>Sylvia Plath–Biography</h1>,” and because of the similarity, “sylvia plath” might be considered as a candidate synthetic query. 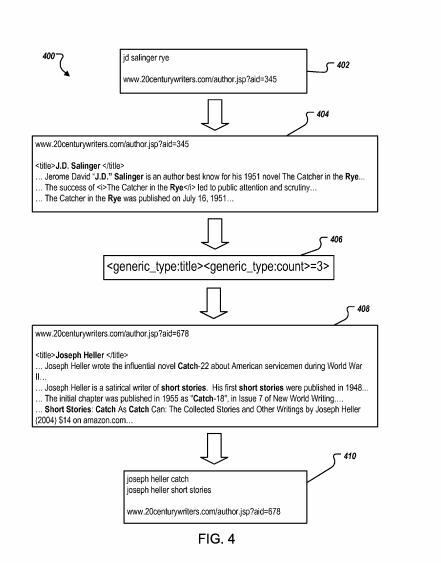 There are additional methods for creating different types of query templates described in the patent as well, that could look to see what words appear in specific types of HTML tags (like the opening and closing tags of a title element), and appear a number of additional times within the body of a document. I’ll be spending more time going through this patent, and exploring the different ways that it describes the creation and evaluation of synthetic queries. Given synthetic queries’ potential uses with both query suggestions, search results augmentation, content targeting for advertisements, and generation of more synthetic queries, it’s an area worth spending more than a single blog post upon. It seems that Google does search Google, to find well-performing queries, even when people aren’t quite searching for those queries yet. And the use of HTML fragments within web pages, such as heading elements and others, is a part of how these synthetic queries might be found. Google is doing something different now a days. I have seen many sites on the first page even though they have spam content and the ones with the original content are on the 2nd or 3rd page.Google is still not a smart search engine. Google added synthetic queries to know if bing is copying its query data or not. Right? Would this include the website’s template / boilerplate stuff? Or just the main content? Interesting concept. I wonder how they plan to address words that are spelled the same, but have different meanings in different context. For example, imagine an pair for “My favorite Salsa”. One search result might be focused on Salsa the dance, while another might return Salsa the food. Looking forward to reading more as you dig in. I have always wondered how the engineers in the search team go about running popular search queries. Do popular queries (example 500,000 searches per month)have a manual review? A â€œtypeâ€ may indicate a category of terms. This basically points out the way the queries are searched and how does the search engine returns them after indexing. The broader the query input, the broader and uncategorized the results in the output as compared to exact searches. Also, the internal linking and HTML fragmentation holds a wider aspect in searched results. Really interesting and rare information among the flurry of posts about algorithm updates and stuff like that. I always wondered how Google would function for those who are inside Google. I was always having the picture in mind where the search engine has no branding or CSS styles, some sort of plain text version. A nice read after a long time. Talking about the query handling by Google, couple of things makes me wonder how their ranking strategy works. I could see some websites with less PR preceding the high PR ones., Even the older sites are being over taken by the newer ones. A â€œtypeâ€ may indicate a category of terms. This basically points out the way the queries are searched and how does the search engine returns them after indexing. The broader the query input, the broader and uncategorized the results in the output as compared to exact searches. Also, the internal linking and HTML fragmentation holds a wider aspect in searched results….. Interesting. I know for a fact that they have used synthetic queries to test to see if Bing was copying their search results, which they almost definitively proved in a post on the Google blog. I would imagine that they do a lot of testing with synthetic keywords. I wish there was a simple way to tell it that it’s using the wrong meaning for homonyms. Every now and then I get some search results that are not even close to what I’m looking for. And what makes it even worse is the ever increasing inclusion of synonyms, which depending on intended meaning may completely miss the mark. It’s likely that Google looks at sources like a statistical language model to try to understand when words that have more than one meaning might be used, and also things query logs and click logs to decide when words are used in different context. Query suggestions also likely come from the technology behind projects like Google’s Webtables (pdf) and Google Squared (pdf). Really interesting information among the flurry of posts about algorithm updates .I would imagine that they do a lot of testing with synthetic keywords. I think HTML tags have only a few rules but Goggle search uses Synthetic Queries for searching with a statistical language model by specifying the search to the limited and accurate results also it depends on the userâ€™s search too.